Buying a guitar can be a tough job for a person who doesn’t even know how to hold one yet. 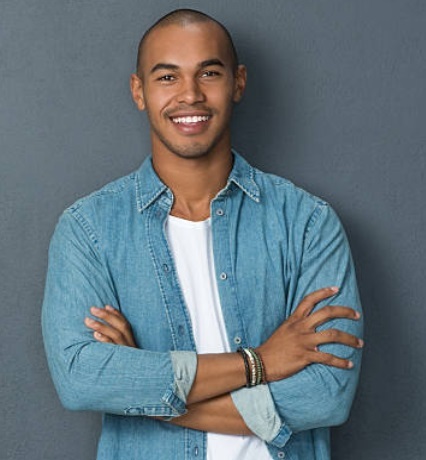 The best thing you can do is do a bit of research before buying the one that looks the best. You will probably have three options when buying: the acoustic, the electric or the classical. If you plan to play classical, then obviously you would be better off buying a classical (The classical and acoustic are quite the same, the difference is that classical uses nylon strings, whereas the acoustic uses steel strings). We’ll now look at the other two options. The acoustic generally costs less than the electric, and this is what beginners usually start with. The electric guitar costs more than the acoustic, and it also requires to be plugged into an amplifier (a guitar amp, not just any amp. And this means you’ll have to buy an amp too) before it can be played. Acoustic and electric guitars also have different techniques which need to be mastered. You will choose one of these depending on the style you want to play. You may also feel that the electric guitar is generally easier to play than the acoustic. It will also be a good idea if you can take along a friend who knows something about guitars. That would be quite a help, as you won’t have to do weird experiments with the guitar in the shop. These are some of the very basics about the guitar. First of all, here is a diagram of an electric guitar. The parts labelled are almost the same in an acoustic and classical guitar. Turning the tuning machines (aka. tuning keys, tuning knobs) tightens or loosens the strings. Don’t try to tighten the strings too much, they break easily. Actually, it’s a good idea idea not to touch them at all until you get to the tuning lesson. See the more detailed guitar anatomy at guitarplayerworld.com, if you wish to know your guitar parts really well. As you can see, there are small metal bars all over the fretboard, called frets. 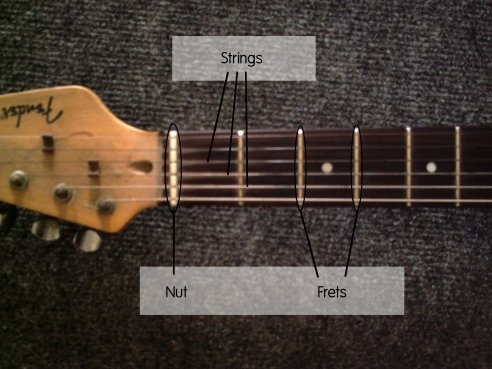 The nut is located just where the fretboard starts, and all strings pass through the nut. ‘E’, ‘E(low)’ or ‘sixth string’ (the thickest one). ‘E’, ‘E(high)’ or ‘first string’ (the thinnest one). ‘Fretting‘ a string means to press down a string just before a fret using your finger. 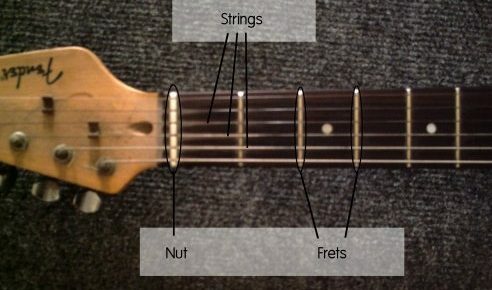 Here is an image showing the B string fretted at the third fret. The string is fretted using the tip of your finger in most cases. 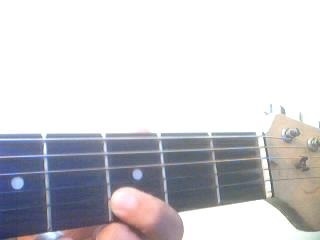 Placing your finger ‘on a fret’ also means placing your finger just before the fret. Now play the high E without fretting it (pluck it with your right-hand finger or thumb or whatever). This should, under normal circumstances, produce some sound. Now fret it on the first fret and play. Notice, the note produced would be of a higher pitch. Now try it with the second, and third. You will notice, the pitch of the sound keeps getting higher. Experiment with different strings and see the sound they produce. Note, if you just touch the string with your finger (don’t press it down) and play it, it will produce no sound. This is called muting the string. So, now you have forced some sound out of your guitar, and you are wondering what to do next. I would recommend you go through each of the lesson in the beginner section one by one. 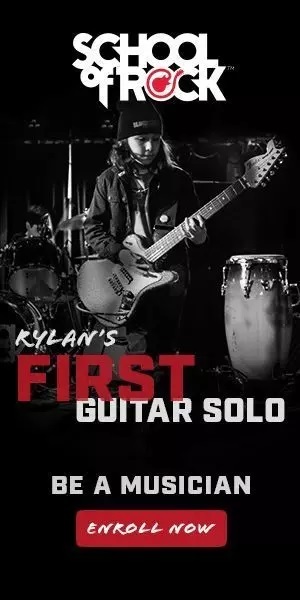 You will learn how to get your guitar ready to be played, how to hold it, and very soon you will be playing. After you are through with the beginner section, check out the theory section, which will guide you through the basics of music theory.